What a week it was in Burnley with the grand opening of the Keirby Hotel on the eve of the important game. It was considered the most luxurious hotel in the north. It had a superb ballroom, a private bath in every bedroom, three luxurious bars, banqueting facilities for parties of up to 250 and special rates for teenage parties. Take a French chef, a pinch of skilled cooks, use some imagination and the result was the cuisine of the Keirby Hotel. The most expensive meal was braised duckling a l'orange priced at 12s 6d but for just 4s 6d (22.5p in today's money) you could have a mushroom omelette. 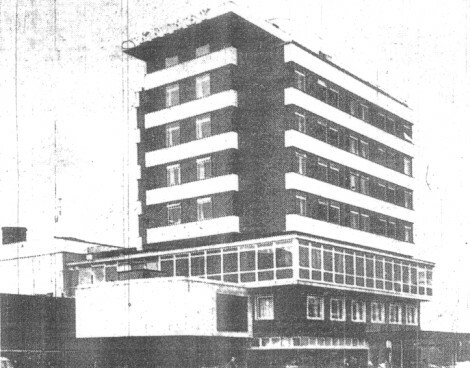 The hotel had been built at a cost of £275,000 on the site of the old Keirby Brewery which was demolished in the 1930s. The land had remained unoccupied until work started on the hotel at the end of 1958. There might have been a new hotel but there was no further news on the plans for piped television in Burnley. At the AGM of the Burnley TV Dealers' Association they were told, via the association's solicitor, that the Town Clerk had confirmed that there was no change in the position. It was put on the agenda for the next meeting although a decision was made to step up the need to collect payments and a blacklist of debtors had been compiled along with the introduction of a system to expedite clearance of information. Big events continued to come to town and the last week in April 1960 was no exception with the Burnley Company of Archers staging the opening meeting of the Varley League matches. Besides the local team there were entries from the Bowmen of Ghyll (Barnoldswick), Walverden Bowmen (Nelson), the Rossendale Bowmen and from Todmorden the Stoodley Archers. It was just the first round of matches, with no news on the early leaders, but all teams were chasing the end of season plaque that had been won in the previous year by the Walverden Bowmen. Burnley's senior probation officer Mr Norman Yates was invited to speak at the lunch for Life Officers. Mr Yates said that he believed the aim of a probation officer was to help to educate rather than to punish and because of this he was very much against bringing back the birch. One poor Burnley butcher was caught arranging meat in his shop window with a lighted cigarette hanging from his mouth. When he found himself in court he said he'd forgotten he was smoking and apologised to the court, saying it wouldn't happen again. Even so they fined him £5 with £2 2s costs. The fines were certainly very inconsistent fifty years ago. £5 for smoking in a shop, and a similar amount a few months earlier for a motorist charged with dangerous driving after hitting and killing the landlord of the Old Duke pub and failing to stop. Spare a thought then for Mr Hans Rack, a German textile worker who was living locally. Herr Rack was set to be married at Burnley Register Office but decided four days before the ceremony to call it off and not go through with it. That landed him in front of the local magistrates who were not impressed at all with his behaviour. Found guilty of a breach of promise he was fined £350. I suppose the moral of that story is, if you are fed up with her you're better of killing her than pulling out of the wedding. In the cricket, both Burnley and Lowerhouse recorded draws with the Lowerhouse professional Jim Minhas taking centre stage. They played East Lancs who batted first and scored 174 all out. Minhas recorded the excellent figures of 9 wickets for 44 runs. In reply, Lowerhouse scored 140/7 with Minhas scoring 51. Top scorer for Lowerhouse was Peter Sutcliffe with 55. Burnley got off to a great start against Todmorden with openers Dattu Phadkar (63) and Derek Riley (72) sharing an opening partnership of 136. They went on to score 197/6 declared. However, Todmorden were never in danger and had reached 166/2 at the close of play. The local media reported ahead of the Fulham game that Burnley were very popular in other parts of the country, so much so that on the return journey from Birmingham after the midweek win they saw people in Staffordshire and Cheshire giving the team coach the thumbs up as it went past. That win at Birmingham had set us up for the Fulham game with Mr Harry Potts naming the strongest side possible for the game. It was billed as the most important last home game of the season in years and a game that should pack the stand and terraces. Burnley, it was said, needed two points, to maintain their championship bid. However, it was not to be with the game ending without a goal. An end of the season gloom hung over Turf Moor after the match. It was not the usual nostalgic lingering with the feeling that another football year was past and gone, or the bidding of farewell to football friends who, because of it being the last home match, would be separating for several months until another season attempted to claim their attention. In fact, many of those present may have been so overcome with disappointment that probably they forgot to wish each other "All the best and a pleasant summer." Whatever their feelings - and many looked despairingly glum - they have had a most entertaining year with enough memories to last them through the close season and give them time to recover for the next. This game could be pigeon-holed as the 'great let down.' Most people expected Burnley to beat Fulham and journey to Maine Road, Manchester on Monday with the title almost - if not quite - won. Expectations were shattered in a most un-champion like display which gave the crowd little to shout about and nothing to enthuse over. For a game of such apparent importance it will be forgotten as just another fixture, and a disappointing one at that. Fulham had little interest in the affair except as a visit necessary to round off the programme. In fact, at the start of the game they did not appear to have any other object than wishing the 90 minutes would fly by as quickly as possible so they could get back to London and Thames-side Craven Cottage and hang their boots up until 1960/61. They played as if they expected to be beaten, and then when they found that Burnley were not absolutely bursting with enthusiasm for a winning bonus, decided that they might as well have a go for it themselves. The Burnley defence was the better part of the team. The forwards lacked method and punch and Meredith was about the best of a mediocre front line. Both goals had escapes, of course, but as the game wore on Burnley had a look of desperation while Fulham were nonchalant about the whole business. And from the point of view of the club, the attendance must have been a bit of a shock. A championship match and under 30,000 present. Burnley: Adam Blacklaw, John Angus, Alex Elder, Jimmy Adamson, Tommy Cummings, Brian Miller, Trevor Meredith, Jimmy McIlroy, Ray Pointer, Jimmy Robson, Brian Pilkington. Fulham: Tony Macedo, George Cohen, Jim Langley, Alan Mullery, Roy Bentley, Eddie Lowe, John Key, Brian O'Connell, John Doherty, Johnny Haynes, Trevor Chamberlain. Referee: Mr A. Holland (Barnsley). The season was over apart from one game - Manchester City v Burnley - to be played two days later on Monday 2nd May. It was all quite simple now. Wins for Wolves and Spurs had left us in third place. Spurs were out of the running. If we failed to win at Maine Road then Wolves would be champions for a third successive season. If we won we would be Champions of England. Without doubt, it was going to be a very important day in the history of Burnley Football Club.